Many conferences have been devoted to the topic of human origins. Most of these have the equivalent of a ‘fossil record’ in the sense that the speakers contribute chapters to an edited volume, or to the special issue of a journal, but what was actually said at the conferences, including the back-and-forth between the attendees, is lost. That was not the case for a symposium sponsored by the Wenner-Gren Foundation for Anthropological Research on ‘The Origin of Man,’ which was held between April 2nd and April 4th, 1965, at The University of Chicago. Someone not only had the foresight to record the proceedings, but they also made sure the recordings were transcribed, and then saw to it that the transcripts of each session were intelligently edited by Paul L. DeVore. 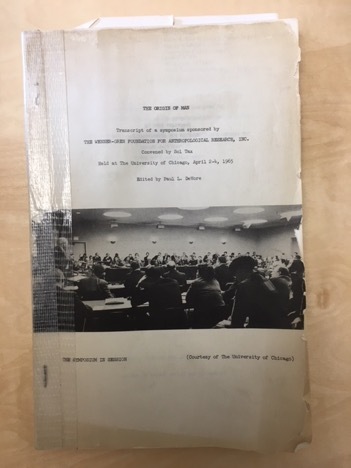 A mimeograph copy of that transcript was then made available through the journal Current Anthropology for the princely sum of $10—my rather battered copy, which was inherited from a colleague in Liverpool, is held together with duct tape! What makes the transcript particularly valuable is that it not only includes the presentations, but it also faithfully records the extensive discussions that followed the talks. It is thus a rich resource for historians of science, and a trip down memory lane for those of us old enough to have met and interacted with at least some of the personalities whose contributions are captured in the transcript. In addition to the organizer and chairperson, 122 researchers were registered as participants¾ although a much smaller number of people feature in the transcript. The organizer, Sol Tax, was a cultural anthropologist, but an unusual one in that he not only convened this meeting, but five-years earlier he had organized a meeting to commemorate the 150th anniversary of Darwin’s birth and mark the 100th anniversary of the publication of the The Origin of Species http://darwin-chicago.uchicago.edu/50th-anniversary.html, and edited the three volumes of the papers presented at the meeting. Tax’s embrace of 4-field anthropology led him to explore other ways to bring together anthropologists from the sub-disciplines and from around the world, and with the support of the Wenner-Gren Foundation he founded the Yearbook of Anthropology, which in 1959 changed its name and format to become the journal Current Anthropology. Tax served as editor from its launch until 1974. As well as being a Professor in the Anthropology Department, Tax also served as the Dean of the University Extension, now known as The University of Chicago Graham School of Continuing Liberal and Professional Studies, and the 1965 conference was part of the program offered by the University Extension. The symposium was planned to coincide with a visit to the USA by Louis Leakey, so that scientists working in North America could hear first-hand about the slew of recent fossil discoveries from Olduvai Gorge made by Louis and Mary Leakey, as well as the developments in dating techniques that had demonstrated their extreme antiquity. In an era when we expect hominin discoveries to be reliably dated using what used to be called “absolute” dating methods, the import of discovering hominins in a reliable geological context that provided evidence of synchrony, plus mind-bogglingly old dates, cannot be sufficiently emphasized. While Louis Leakey’s presentation of the results of research at Olduvai was the main emphasis of the symposium, it was not its only focus. The other two main speakers were Irven (Irv) DeVore, who spoke about the evolution of hominin behavior, and Sherwood (Sherry) Washburn whose presentation was entitled “An Ape’s Eye-View of Human Evolution.” Clark Howell, then in the Anthropology Department at The University of Chicago, provided a summary. Other speakers included Garniss Curtis, who spoke about recent progress in dating the Olduvai discoveries, and David Pilbeam, who spoke about the results of his recent research on Miocene primates conducted with Elwyn Simons. There is enough fodder in Louis Leakey’s typically provocative presentation for a semester-long graduate seminar, so I will limit myself to just a few of the topics he touched on. I only heard Louis Leakey give a talk once, but this transcript captures his free-wheeling style of presentation. Early in his talk he emphasized that recent discoveries, many of which were made since the Darwin Centennial meeting a little over five years before, mean that “we’ve got to look at the origin of man and all the problems related to the origin of man with fresh eyes” (p. 3), with the clear implication that it should be through his eyes. With respect to the recent discoveries at Olduvai, Leakey stressed that they provided evidence of what we would now call taxic diversity. Not only had Homo habilis been found alongside Zinjanthropus boisei both early in Bed I and in upper Bed II, but he suggested that a third hominin “the Pithecanthropus type” (p. 11) was also found in upper Bed II. Later in his talk Leakey added the possibility that, because OH 16 “fits in better with the Pithecanthropines” (p. 15), then there were three hominin taxa at Olduvai earlier than upper Bed II times. Leakey also emphasized his belief that because H. habilis and Z. boisei occupied different niches with little “overlap in their food requirements” (p. 12), then they did not compete to any great extent. He suggested that one (presumably H. habilis) “must have been a better toolmaker” and the other (presumably Z. boisei) “must have been much more vegetarian” (p. 12). It is curious that he chastises Napier and Tobias (196?) for suggesting there was “evidence that Homo habilis was more likely to be the tool maker” (p.12), when he was a co-author of a publication that included the following: “While it is possible that Zinjanthropus and Homo habilis both made stone tools, it is probable that the latter was the more advanced tool maker and that the Zinjanthropus skull represents an intruder (or a victim) on a Homo habilis living site.” (Leakey, Tobias and Napier, 1964, p. 9). The discussion of Leakey’s lecture was pretty tame, with most of the questioners asking for clarification about the geological context of some of the fossils: the real fireworks come in the later sessions.